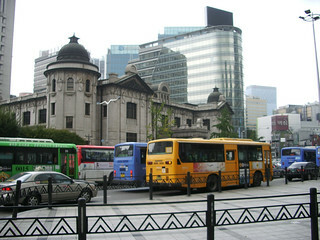 That Japanese colonial era building used to house the Bank of Korea, and is now its currency museum. It has an excellent collection of currency from every Korean nation-state, from proto-kingdoms to the modern day (including North Korea), as well as a good selection of currency from around the world, plus information on fiscal policy and the role of a national bank. - Yellow: loop service within a single zone. Rarest/cheapest. Two-digit numbers, first digit is the zone. - Green: connects subway stations to nearby neighborhoods. Most common. Four-digit numbers, the first digit is the starting zone and the second is the terminating zone. - Blue: trunk line service across the width of the city. Three-digit numbers, the first digit is the starting zone and the second is the terminating zone. - Red: premium service, guaranteed seating, running to the suburbs beyond city limits, most expensive. Four-digit numbers, for Seoul-based buses the numbers are in the 9000-series (numbers differ for suburbs-based buses visiting Seoul). Smart RFID debit cards, such as T-Money, were also introduced with these new bus types. They are good for discounts off of cash fares, and for free transfers between buses and to/from the subway. My T-Money card was the most invaluable ally in my travels throughout Seoul and into nearby areas. In South Korea, urban bus lines are planned by the city transit authorities, but actual operation of the buses is by private concessionaires, of which there are about 40 in Seoul. Each bus displays the name of the operating concessionaire in small letters. The concessionaires have a joint industry group to voice their concerns, and their employees have a consolidated labor union as well, which is unusual in South Korea, where labor unions are otherwise specific to each employer.